WOULD YOU LIKE TO INCREASE BRICK PRODUCTION WITH A QUALITY REFRACTORY? NEW DEVELOPMENTS FOR INCINERATING HAZARDOUS MATERIALS IN ROTARY KILNS. TEIDE REFRACTORY SOLUTIONS has developed specifications that are explicitly designed to support the demanding conditions of rotary kilns when burning hazardous waste. In this type of kiln, chemical attack via the infiltration of trash, thermal shock due to the evaporation of liquids, and abrasion caused by wear and tear are the most notable processes that minimise the useful life of refractories. Recently, TEIDE has optimised refractory materials for non-ferrous metal casting rafts; specifically for zinc casting. With this development TEIDE has expanded its range of refractory products for this use and customers can already choose from cementless concretes, such as GLASS, medium or high alumina concretes, and self-flowing refractory concretes for application in sites where pouring is difficult. DRYING AND CURING OF REFRACTORY CONCRETES AND FILLERS. Recently TEIDE REFRACTORY SOLUTIONS has employed special machinery to dry and cure refractory parts. This new burner complements the four driers the company already owns. The advantage of having an auxiliary burner lies in the ability to perform more precise drying and use temperature control that is more suited to the circumstances and conditions required by the refractory material. TEIDE REFRACTORY SOLUTIONS, S.L. ATTENDED THE 9TH NATIONAL CONGRESS ON MATERIALS, MACHINERY AND FITTING REFRACTORIES HOSTED LAST WEEK IN OVIEDO. Teide attended the meeting of the technical committee, the ANFRE Board of Directors assembly, and the 9th Congress on Materials, Machinery and Fitting Refractories. Speakers at the event offered highly dynamic conferences, providing the latest studies on their newest products and the overall state of raw material resources, which has a huge effect on the refractory sector. TEIDE REFRACTORY SOLUTIONS WINS THE BID FOR THE REFRACTORY COATING OF 150 WAGONS. 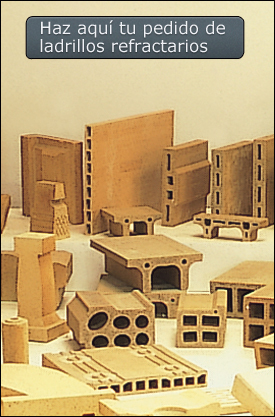 In relation to shaped refractories, TEIDE REFRACTORY SOLUTIONS has production lines for manufacturing shaped, pressed parts and shaped, extruded parts. In shaped, pressed parts, the final geometry is achieved by placing the material in a mould, in which pressure is then transmitted by a press. The shaped parts (150-650 kg/cm2) are denser, less porous and have greater mechanical resistance. TEIDE REFRACTORY SOLUTIONS DEVELOPS THE R-COR-MULL-50-A-G QUALITY. The technical staff of TEIDE REFRACTORY SOLUTIONS has recently developed the R-COR-MULL-50-A-G refractory quality, which is suitable for processes exposed to operating temperatures of 1300 ºC. The final appearance of the viaduct after baking is shown below.